Drake stopped by Miami Senior High School on Monday, where he filmed part of a music video and donated $25,000 to the school. The Canadian rapper was at the school to film his latest single "God's Plan." "Best Day Ever! The REAL Drake was at the High today! Thanks for giving back to the community!" the school wrote on Twitter. "Thank you Drake for supporting public education," Miami-Dade County Public Schools Superintendent Alberto M. Carvalho wrote on Twitter. During the event, the hip-hop mogul announced students at the school would also receive uniforms. "God's Plan" is holding at #1 on the Billboard Top 100 Songs chart. 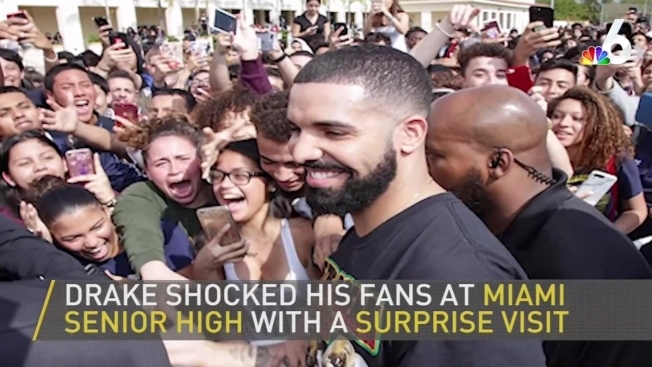 Following the visit at the high school, Drake visited the University of Miami campus where he handed over a $50,000 scholarship check to a student outside its Frost School of Music.